This is an interesting piece in the New York Times coming off some potential regulation coming due to the wickedly volatile action in the energy markets [Jun 17, 2009: CNNMoney: Obama v the Oil Bubble] I am sure there are simple solutions such as raising margin requirements and a few other technical items that those more versed in the commodities market could suggest, but since that might curtail profits of those who line the pockets of politicos its going to take a long time to get to that point where any change happens. Until then we'll have oil rocket up as oil tankers sit packed with merchandise the world over as we hear the chants "it's all about supply and demand baby!". I would assume the truth is more along the lines of "supply" of paper dollars thrown into the system chasing after fixed amount of "smallish" markets that are commodities. The wickedly devised ETFs for oil and natural gas also don't help one bit. The extreme volatility that has gripped oil markets for the last 18 months has shown no signs of slowing down, with oil prices more than doubling since the beginning of the year despite an exceptionally weak economy. 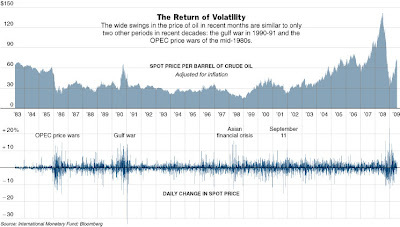 Volatility in the oil markets in the last year has reached levels not recorded since the energy shocks of the late 1970s and early 1980s, according to Costanza Jacazio, an energy analyst at Barclays Capital in New York. “People do not like that kind of volatility, they want to know what their costs are going to be,” said Bernard Baumohl, the chief global economist at the Economic Outlook Group. While the movements in the oil markets have been similar to swings in most asset classes, including stocks and other commodities, the recent rise in oil prices is reprising the debate from last year over the role of investors — or speculators — in the commodity markets. ... unlike most of 2007, when the economy was still not in recession and demand for commodities was strong, the world today is mired in its worst slump in over half a century. I will end this piece by saying on some small chance that the oil price today is "correct" with most portions of the world economy in tatters just imagine what happens when the economy recovers. I'd expect a constant gyrating between recession and spikes of recovery based on energy prices, since each recovery would lead to massive price swings up ... which in circular fashion would lead to dampening of economies. That said, I am sure there is a lot more behind the scenes going on to explain the pricing. I'll let smarter people than I debate the particulars, but for now oil is just another correlated asset that can be pushed around by computers bidding and asking away. [Jun 30: Correlation Among Asset Classes Highest Ever] Remember economics 101 is now very out of fashion [Jun 8: Dennis Gartman - Short Term Bearish in Oil] instead, now we have a central bank whose main role is to engage speculators in between creating bubbles. Here is my favorite quote from the story - good ole supply and demand? Meaningless. Economics 101 apparently does not work with all the new fangled financial innovations we've created - Frankenstein style. If we're not going to have actual productive businesses anymore, I guess this is how we make an economy thrive! Speculation on asset classes based on "easy money". Why not? It's a lot easier than actually trying to "make something"; we'll leave that non innovative stuff for the "3rd world" countries. We're post modern baby! And if that speculation screws up the last remaining industries that need oil, we can offshore you too. Stop your complaining Southwest! As for the consumers crunched by the speculation? A necessary byproduct of "prosperity" for a narrow sliver of society. The consumers job is to show up with their grandchildren's piggy bank at appropriate times (when our innovation goes too far - then Main Street = Wall Street), and otherwise be silent and let us do our work. Thank you for your participation.